As a proud elephant loving company, we are so so so over the moon excited for today's introduction of Fly With Me. Designed by the talented Aida Zamora, this set features her whimsical storybook like illustrations that are as sweet as can be! 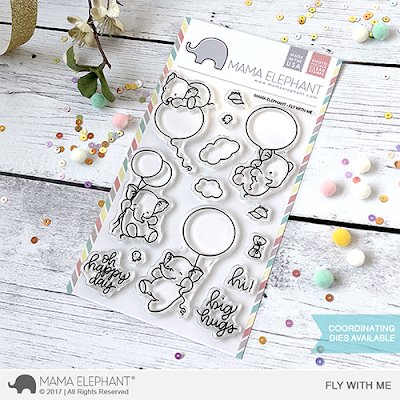 These cute elephants are flying high with balloons and read to make a big statement! Occasional Labels was first introduced back in September as the promotional freebie, now they're available for purchase! Such a great set of great, basic sentiments that you can't pass up on! In a modern labeled block style, these are fun to use with colored inks pads or simply in black to really make your sentiment stand out! 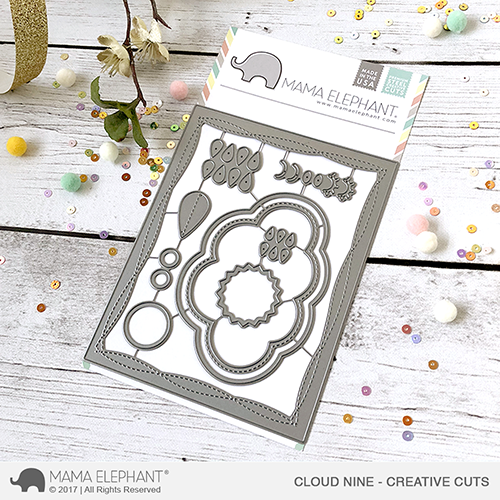 Cloud Nine is an A2 style designed die set that really compliments our offerings this month. The largest frame has a beautiful stitched edging mimicking the uneven stitch lines from a sewing machine. You also get this beautiful large cloud shaker combo to create shaking fun! Also included are elements like a face builder for the cloud, raindrops, ad even a large stitched raindrop so you can make it 3d and give it some dimension! The little elephant is not glued down, which makes a cute little interactive keepsake for the recipient! These are simply adorable!!! I love them!! Love ME stamps and all the great new releases! I can see where I'm going to have some ME shopping to do next week - sooooooo adorable! Love that box, too. Oh my!!! These are absolutely darling!!! Now I must have the elephants and the dogs! Just so stinkin' cute! Too CUTE! I love how you created the cloud...so clever! The cloud die set is absolutely 100% ADORABLE! I must have it, all !!!!! Eek! How sweet are these! Now I need all of them! Oh my gosh, the box is perfect!!!!!!!!!! Oh my goodness !! How can you possibly make it even more cute every time ? I am new to ME and I must say I am completly in love!!!!!! Oh My! I love this little Elephant! The cloud die and the Fly with Me stamp set are such a cute combo! The elephant set is SO adorable and the cloud die set looks like it is going to be a lot of fun! OMG I can not believe how cute those elephants are!!!! Fabulous samples! I'm in love with Cloud Nine! oh my gosh the cards and images and dies are wonderful. I love your products. Oh those elephants are beyond delightful, I will have to be buying those, your examples are so stunning, great idea's to start us all off with. Love the shaker cards! Great fun for creator and recipient! These elephants are heart-stealingly adorable! I'm going to have to get them. 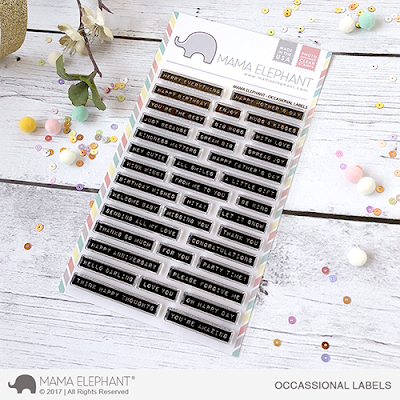 I'm so excited that Occasional Labels is now available too. Oh w💥w mama elephant what are you doing to my purse strings. I think they are going to be well and truly cut with this release. It just gets better and better. Looking forward to this brilliant blog hop. I'm off hopping now.